The constellation Crater. Roll mouse over to see labels. Crater is a faint constellation in the southern sky which appears highest in the evening sky in the months around April. It contains only one star brighter than fourth magnitude, and does not contain any bright deep sky objects since it lies well away from the plane of the Milky Way. 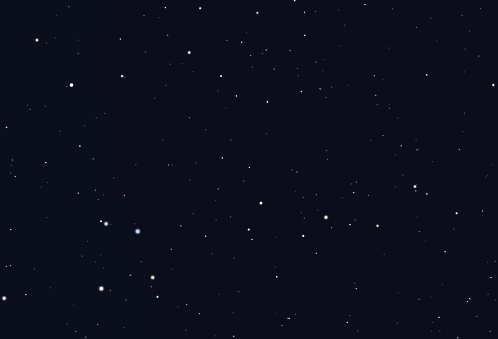 It can be found next to the more prominent constellation Corvus, the crow. Mythologically, the two constellations form part of the same tale. The bird returned and lied that a water snake had preventing it from filling the cup, and returned with the snake in its tallons. Apollo saw through the ruse, and cast all three into the sky as Corvus, Crater, and Hydra (the water snake). 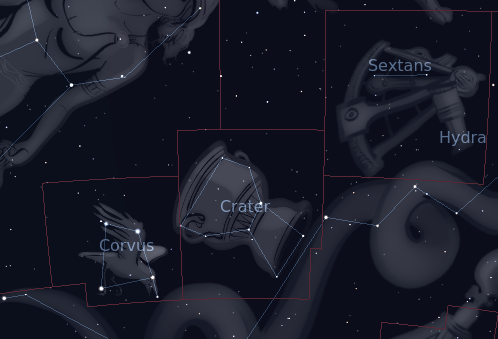 The following constellations neighbor Crater: Corvus, Hydra, Leo, Sextans, Virgo.